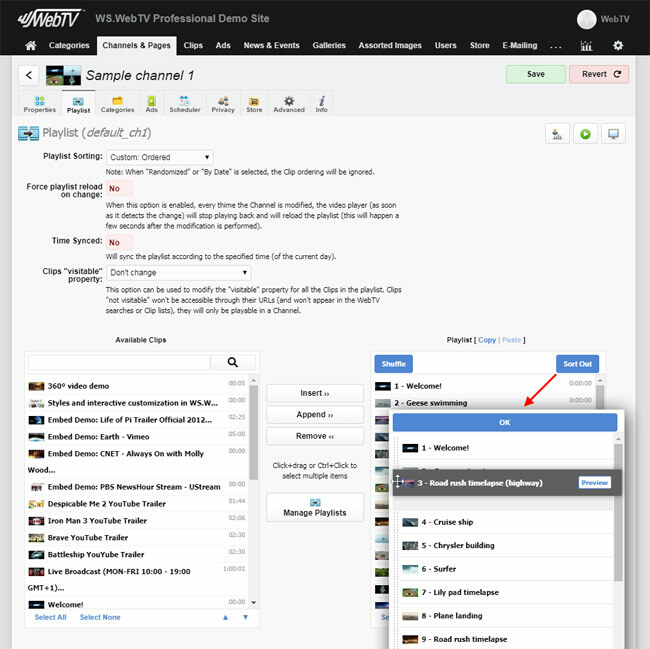 Bellow you will find the list of features included as standard with every license of WS.WebTV Professional. • Support for streaming video playback2: Live or On-Demand, including Adaptive Multi-Bitrate, HLS and MPEG-DASH support. • Support for interactivities and banner overlays6. • Support for time-synced playlists (fake lives)2. • Support for 3D video playback5. WS.WebTV has been designed to look great on most Web browsers, either desktop or mobile ones. It includes a beautiful, customizable, responsive Theme which will look great on modern browsers (note that in the case of Internet Explorer, the minimum required version is 8). Additionally, a "Classic"/legacy Theme is also included (customizable too), which is compatible with older browsers like Internet Explorer 7; this "Classic" Theme although not responsive does have a mobile interface version intended for Tablet/Smartphone viewing. 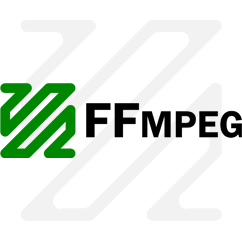 WS.WebTV Professional not only allows you to easily include your own logo; it also has a great tool that will help you in customizing (almost completely) the style of WebTV (colors, fonts, etc. ), interactively, with real time preview (no need to write code! ); additionally, this tool includes several presets for your convenience. 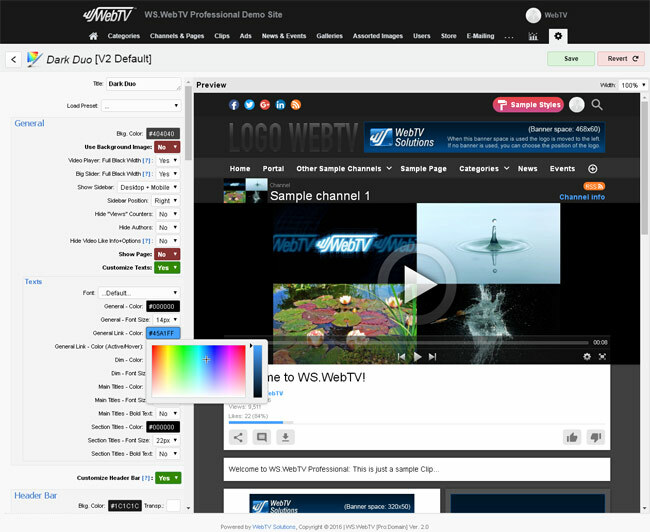 WS.WebTV Professional includes two layouts (templates) for channels and videos: panoramic (the default) and "WS.Tube" . You can use a different layout for each channel!. 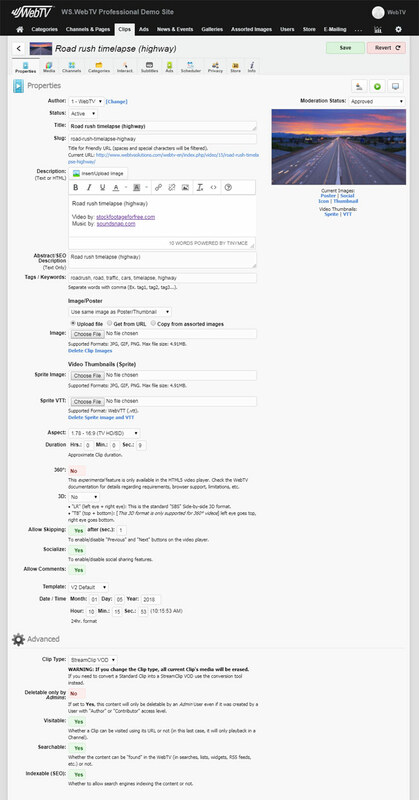 Additionally, almost every content can use a different template (in case of being available). 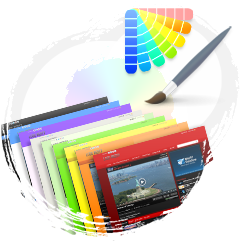 Our solution has been developed with Web designers in mind. If you have HTML and CSS knowledge you can create your own themes, template variations and styles. 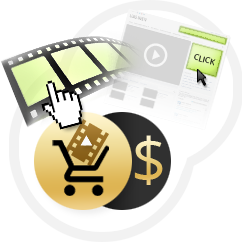 Monetize your WebTV by including your own video Ads, banners and (optionally) by selling access to your content. Video Ads: Include your own clickable video Ads (VAST supported*); either Clip/Channel pre-rolls, Clip post-rolls or Channel mid-rolls (which are Ads that get inserted into a Channel's playlist). Video banner overlays: Through the "ClipInteractivity+" extension (included in the "Ultimate" bundles) you will also be able to overlay banners over videos (VAST supported*). 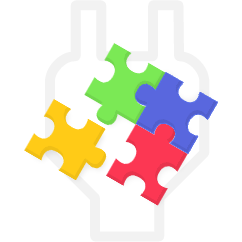 Standard banners: Include banners from Google AdSense, DoubleClick, AdBrite, OpenX Ad Server or any other Ad server (any HTML code) into the predefined banner spaces (or through widgets). 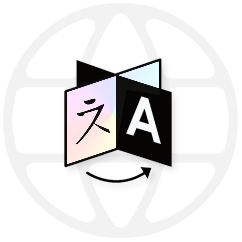 Additionally, you can edit the WebTV templates in order to include additional areas for publicity, with the desired code (HTML/JS, etc.). Pay Per View ready: Through the optional "Store" extension (included in the "Ultimate/PPV" bundle), you will be able to sell access passes to watch and download "Premium" (restricted) content, directly from your WebTV (Pay Per View/Pay Per Access). WS.WebTV Professional includes an Anti Ad Blocker. You can configure the system so that, when an Ad Blocker is detected, a notification is displayed to the visitor (and also block the viewing of the Site). 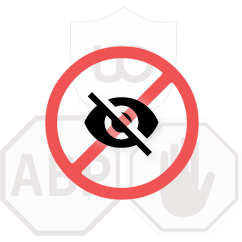 Additionally, you will be able to enable or disable the Anti Ad Blocker globally or per content. For each Channel, you can create several playlists (only one can be active at a time). This is useful, for example, if you wish to create a different playlist for every day of the week. This feature is complemented by the optional "Scheduler" extension, which, among others, allows you to automatically select the current Channel playlist according to a date or day of the week. Playlists synced with time allows you to simulate a TV Channel broadcast (fake live). The player will start playing back the corresponding video according to the start time as well as the current time. This funcionality is complemented with the possibility to create several playlists as well as the "Scheduler" extension (included in the "Ultimate" bundles), when used in conjuntion you will be able to activate a different playlist for each day of the week. 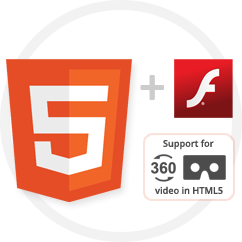 *In order to achieve the best playback experience on Flash (note that you don't need anything special on HTML5, which is the default playback technology) you must use streaming playback (optional StreamClip extension required), a Media Server or CDN to serve the video files; additionally, you must not include EmbedClips into the playlist. Overlay links during video playback. This feature is really useful to link video content to other websites with complimentary info, online stores, or simple for selling publicity. You can add any amount of links per video. Additionally, through the "ClipInteractivity+" extension (included in the "Ultimate" bundles), you will be able to overlay banner images and add subtitles over the videos. WS.WebTV Professional has multiple options for storing/serving video and image* files, which make it easy to integrate with CDNs and Media Servers: It can be configured to use either local or external servers for storing and accessing video and image* files. Videos: When files are stored locally, they will be played back from the server where the WebTV is installed. 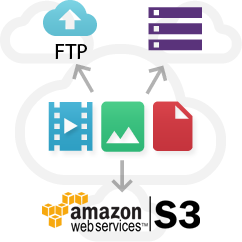 When using external servers, it can upload files using the integrated FTP functionality or to AWS (Amazon Web Services) S3; the files can be played back by using HTTP and RTMP2 URL formulas you specify. 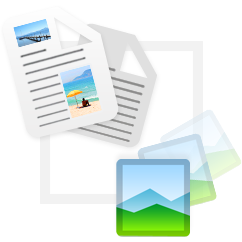 Images: When files are stored locally, they will be served from the server where the WebTV is installed. When using external servers, it can upload files using the integrated FTP functionality or to AWS (Amazon Web Services) S3; the files will be referenced using the base URL you specify. Through the News & Events extension (included in the "Ultimate" bundles) you will be able to include News and Events without needing to use a blog or any addicional CMS: everything is integrated into the WebTV. 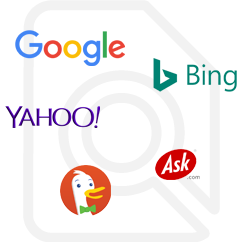 User Management, content privacy, user created content and more. The application has a complete User management system in its core. Additionally, through the "Advanced User Management" extension (included in the "Ultimate" bundles), you will be able to create users of different access levels and privilege sets, restrict content access, reassign content ownership, allow user registration and user content creation (with moderation tool), send newsletters to registered users, receive E-Mail notifications about actions performed by non-Admin users, and much more. Additionally, in the case of having the Advanced User Management extension, you can also configure the WebTV to encrypt the personal User information (like E-Mail, name, etc.) and to ask for User consent for the reception of E-Mailings. The passwords for credentials like FTP, AWS, etc. are stored encrypted into the database. Out-of-the-box configurable IP blocking for IPs with several failed login attempts. Additionally, the system limits the login requests to one per IP, per second. 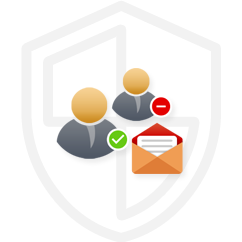 Complementing the out-of-the-box functionality, through the optional "Advanced User Management" extension, you will also be able to receive E-Mail notifications when an IP gets bloqued and log all failed login attempts (with CSV export functionality). The Advanced User Management is complemented with the logging system, which registers most of the user's activity into daily log files. Each log entry records the time/date, the user (regardless of its access level), the action, the IP and user agent info. WS.WebTV includes a Backup functionality that will help you in performing backups of your Site: You will be able to create "on demand" backup projects and automatic/periodic ones. 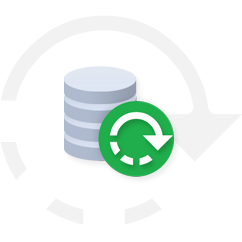 It also allows saving the resulting ZIP archives into the local server or to external storage (AWS S3 / FTP). As for today, WS.WebTV is only sold as a "bundle" of license + extensions and most of the available extensions are included as standard features. Please check the Purchase page for information on what is included in each bundle. WS.WebTV is a professional product designed for individuals and companies of any kind.  Additionally, unbranding is available, for those interested in reselling the solution. WS.WebTV IS NOT A TEMPLATE, it is a proprietary -all-inclusive solution (Back-End + Front-End)- which is NOT based on other CMSs. It is robust and consolidated, with almost 6 years in the market, hundreds of installations and backed by a personalized technical support which we are proud of. Due to its nature, our system is less prone to security issues respect to other open source solutions. • Easy to use and mobile friendly (responsive) interface. 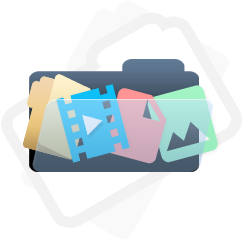 • Create, batch-create7, edit, batch-edit, activate, deactivate and delete Clips. 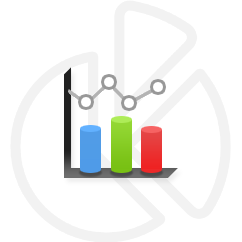 • Statistics section: With statistical information regarding Clips, Ads, Channels, Interactivities, Searches and more. • Session concurrency check: Two users can not use the same credentials to log in, at the same time (this functionality can be disabled if required). WS.WebTV Professional is available with the following license types: URL (estandard), Domain and Intranet9. Contact us for more information. 1 WS.WebTV has not been tested on BlackBerry devices. 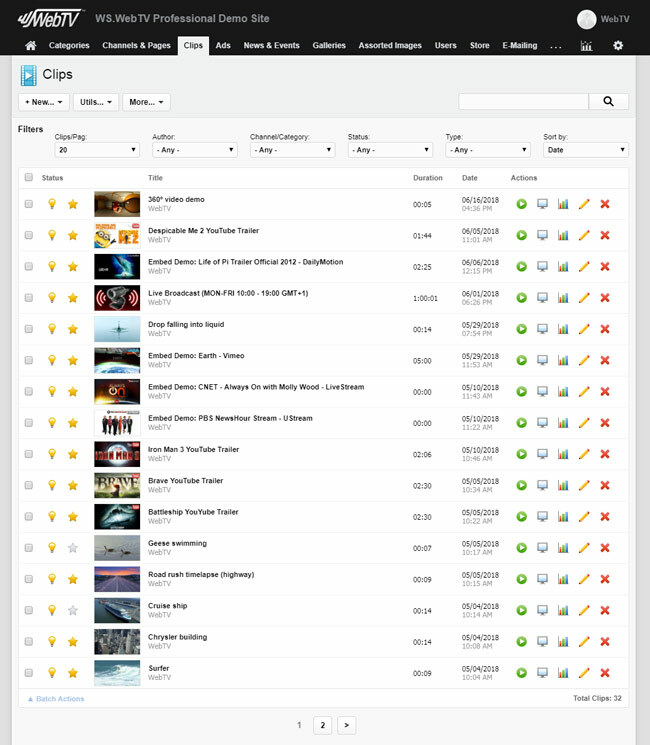 2 Live or VOD Streaming playback through StreamClip extension (included in the "Ultimate" bundles). 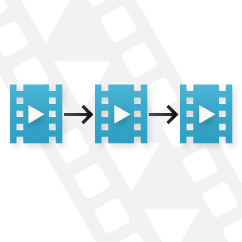 3 FLV can only be used on the Flash video player. WebM can be used along MP4 H.264. 6 Subtitles and banner image overlay through Interactivity+ extension (included in the "Ultimate" budles). 7 Through Batch Creator extension (included in the "Ultimate" bundles). 8 Through News and Events extension (included in the "Ultimate" bundles). 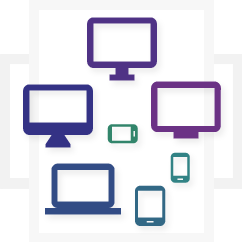 9 Social features will not work on Intranet WebTVs. • Some features/tabs/buttons displayed on the screen captures might correspond to optional extensions (not included with the basic version of WS.WebTV Professional). • The version of WS.WebTV Professional used for the screen captures might be different than the current commercial version; therefore, the screens could be different than those of the version you purchase.